am as well pleased with the place as I expected to be. I have no doubt but I can obtain a living by my profession here & as I had not formed any sanquine expectations, so let events turn out as they will I shall not be much disappointed, if attention to my business & industry in my profession will secure me a share of professional business I shall obtain it, Doct Judd wishes to obtain a loan of two or three hundred dollars, & he wished me to write to you respecting it, he has lately been building (& building a large house has been more costly than he expected) he has very extensive business here & is the owner of considerable landed property - in this country there is at present a complaint of great scarcity of money - as soon as I have established myself permanently, I will write more particularly respecting the country. I shall wait until Harris & Stevens arrive here before I hire my board for any lenght of time. I wrote a letter from Syracuse which I expect you have received. I remain your dutiful & affectionate son Henry Eno Mr Stephen Eno P.S. 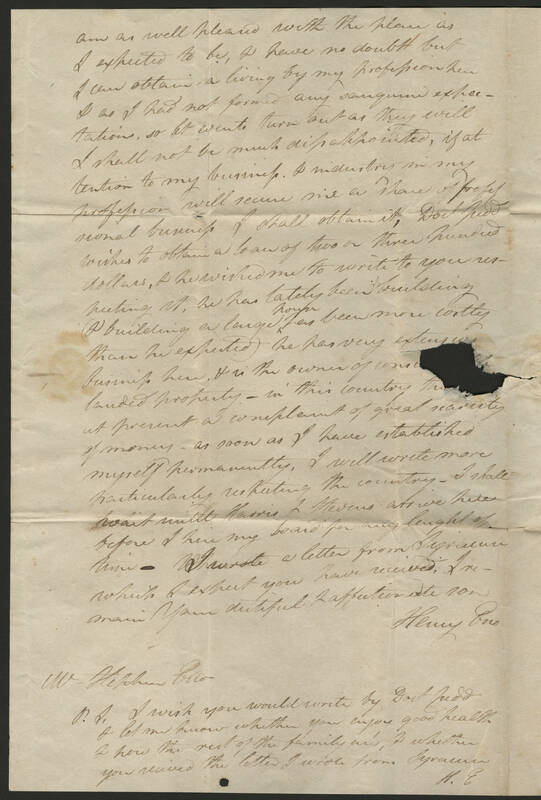 I wish you would write by Doct Judd & let me know whether you enjoy good health & how the rest of the family are, & whether you received the letter I wrote from Syracuse. H.E.